Sony and Lego are working together on creating a new generation of products that bridge the gap between toys and video games. A joint research project between Sony and Lego aims to come up with future projects that are part toy, part video game. A team of researchers at Sony Computer Science Laboratories in Tokyo is embedding tiny motors, cameras, and actuators into Lego blocks. 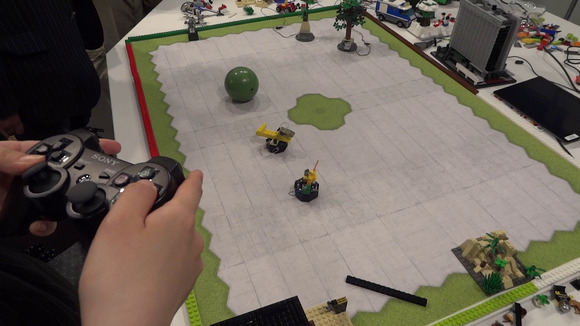 One demonstration uses two small motorized Lego platforms, one of which is computer-controlled and will relentlessly pursue the other, which can be maneuvered using a wireless PlayStation controller or by hand. Any combination of blocks can be built up on the platforms, and more platforms can be added. The system could be used to create Lego battles, or simply play tag. The research team has also added actuators that can cause Lego structures to crumble on demand, and camera blocks that can beam first-hand video of the action to tablets and smartphones. "Lego is concerned about losing kids to video games," said Ganta Kondo from Sony's research and development division. "We want to keep the size small, but add interactive games." The project is currently in the experimental stages, and there are no concrete plans for consumer products from the collaboration. Current problems include the short battery life that comes with tiny components and accurately keeping track of the active components. The research was shown as part of an open house at the Sony Lab. Another project was an application that can stretch and twist video of objects in real time, allowing for instance restaurants to be enlarged based on their popularity. Other research includes a small quadcopter that is controlled by the physical movements of its operator, who wears a Sony head-mounted video display, and an Android-based server for remote control of home appliances. Updated at 11:52 a.m. PT with a video report from IDG News Service.